Congratulations to everyone who made it to Z! Black and white stripes of the Zebra Crossing can teach you a life's lesson or two! 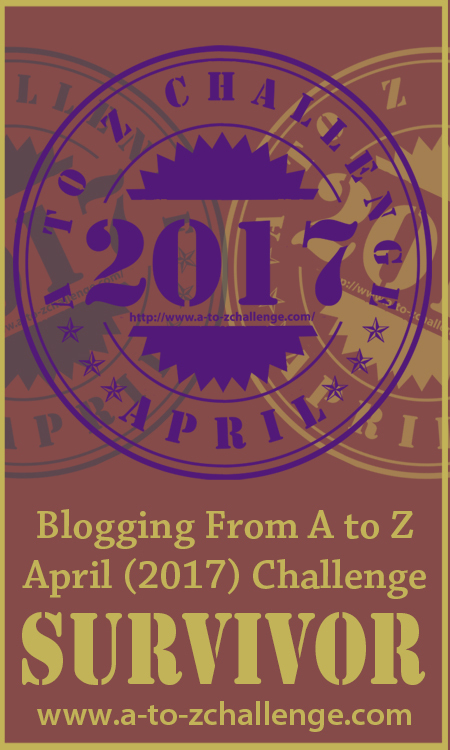 Find out how... with this concluding article for the #AtoZChallenge! We wish to express our heartfelt thanks to the organizers and fellow bloggers for this wonderful journey called #AtoZChallenge! Special thanks to Ms Gayatri Gadre Be Young Forever for introducing us to this challenge and helping us at various stages! It was so much fun visiting many new blogs during this challenge; and learning a lot from people all over the world. I'm so thankful for every person who came to visit my blog and left a comment. Your time and thoughtfulness is appreciated. Congrats to all who have made this challenge a GREAT one. Have read some amazing facts, poems and post. Are we related to an astronaut or is it just a family myth? Fact or Fiction-Family Stories. With the front of my A to Z quilt complete yesterday Zenith has to go onto the back. A fond farewell from the good folk of Amble Bay. Thank you so much for the overwhelming response and hundreds of encouraging comments I received during the challenge. I can't believe it happened! See you in 2018 if not before. IGNORE THE ABOVE LINK PLEASE! Your last full day in Amble Bay CORRECT LINK! 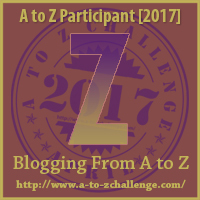 Z is for Zero - no more 2017 A to Z Challenges left to do! Living in La Yacata will keep you from becoming a Zombie! Tiger hears drumming, along the path comes a young man, who looks exactly like the Heavenly Prince. Tiger leaves his cave and dances behind the man. To read the stories go to my wattpad site. Hi all! It has been an amazingly exciting month, full of creative fun and learning. I thank the A to Z team for all the fun moments that i have had in this wonderful challenge . My best wishes to all my co-participants . May we continue to be inspired , and inspire each other. I want to end my challenge with a realization. It's not a "Z" post but I want to thank atoz blog and everyone who I've met through this challenge! Z is for Zadie - the conclusion to my A-Z serial story "Circle of Hope"
The last vanity plate from the Maine collection and its poem! ZZZzzz...huh... what? *rubs eyes* Is it time for the last day of the challenge already? *yawns* Come read about sleep at the Wolf of Words. Boom, last day. Congrats to all that made it this far! Last post for this year's challenge. Hope you all had a great time blogging. I sure did. For the last post I wrote on zodiac sign. WE DID IT! ☺ Congratulations to all!! Latest Post: ZORBA THE GREEK: How a lifelong obsession began! Here is a link to my post for Z from my blog Weekends in Maine. The final post of the challenge. We made it! Z is for Zeitgeist Factory | Using concrete in unexpected ways. Hello, here's my post on the letter Z. It's been a great challenge and enjoyed doing this even if I'm tired. It's been a great month. Thanks to all who have contributed. A few added chapters and illustrations and I have an e-Book ready to publish! Link: #AtoZChallenge Z for San Diego Zoo. Well folks, it's been fun playing with you! I hope you'll stop by one more time and see if you can "Name That TV Show!" Hello Fellow A to Zers! Here is the last installment of my ongoing fiction. It's been quite a challenge! Letter Z: Zori : "I dropped the phone and ran to the bathroom to throw up. When I had nothing left in me, I closed my eyes and lay my cheek against the cold bathroom floor where I lay for an eternity..."
Yes, Talking It Out has made it to the end. Woo-hoo! One last post we're calling Zaftig for the body positivity movement. 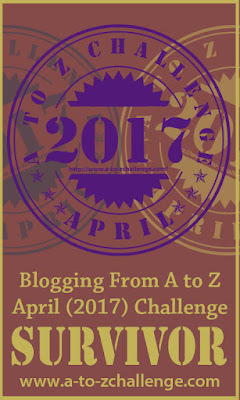 Thank you, A-Z Blog Challenge Hosts! It's over! How do you feel about writing now? We've done it - we've reached Z. I'm going to miss it. Huge thanks to the founder and co-hosts. Well done to all who gave it a go, particular thanks to those who popped by and kept me going. We're here! It's been a lovely AtoZ year. Different yes, for me, better for it. Hope to see you again on reflections day. Name: Eva Blog: Mail Adventures #AtoZ Theme: Postcards Letter Z: Zebra & Zarah. Do you prefer mail adventures or zebras? We are at Z!! !LadyInRead @ MyRandRSpace - Day 30 & ZingingZ. Z is for Zebra The concluding part of the crime thriller story. Congratulations to everyone who took part and completed the challenge. It's been a blast. Thank you to everyone who took the time to stop by and read my effort. Look forward to seeing you for the 2018 challenge! The prospect of a new beginning - but there's a slight snag. Once again it has been a fantastic ride. Thank you so much to all who visited and a very special thanks to the A-Z crew for making it all happen :) Hope to see you all back here for 2018! Short poems on the topic of being a student/pupil as well as a teacher in school. Today on final day of my A-Z of Favourite Things, Z is for my favourite composer - Hans Zimmer. Letter Z: Zeitgeist. Was film noir a reflextion of the 1940s historical and sociological circumstances, or is it semething more universal? And we are saying our Buh-byes. Its been a great ride amigos! See you around. Z is for "Will Zumba for Zucchini Bread"
What a fun ride this was! Discovered new blogs and writers. Wrote evey day for a month. Minimum 400 words per post. The last from Bunny and the Bloke is my story about a superbly simple Sunday! Sung by Satchmo it is Z for Zip A Dee Doh Dah! A look at what it takes to be calm and collected while working towards your dream. Today's the day! We've reached the finish line! Woo-hoo! Woot! Woot! Here's my entry for today... This has been lots of fun, I look forward to doing this again next year! Thank you All A to Z connected to A to Z. Hope to be in touch with you in the days to come. Congratulations everyone -- we did it !! And thanks to all of you who visited and commented during A to Z -- hope we can keep this going all year! I'd say the random thoughts end, but in truth, I'm always random. Phew.. first timer here. My Z post up! Thanks for sharing some love via comments. My theme has evolved into spirituality all around us in stories, books and movies! Z for Zen tday. Do visit and keep coming! Zoo - I live in one! I did it! I did it, I did it! Whoa! Z is for Ba-Zinga!" ~ my Z post - Zodiac ~ do you believe in signs? Z is for Zombies in my last LEGO themed post of this challenge! Thanks to everyone who has stopped by, it's been fun! Let's zoom in to the final post in my What if...? series: What if we could zoom-in with just our eyes? I can't believe we're done already! That's crazy! At least I stuck to the schedule this time round...only one missed day! And I finish on time! Woohoo! Congratulations to everyone that took this journey! I hope you had fun writing (and reading). Until next year...if not sooner! For the final post of Sciency Words: A to Z... zoosemiotics is the scientific study of animal communications. When they began on their 13th adventure at a catacomb in Paris, they did not know that they will be zapped in a horrifying curse. I sure enjoyed sharing my passion for Journaling with all of you! I look forward to participating in this fun, creative event next year! For something I did completely on impulse, this has turned out to be a lot of fun. I already have next year's challenged mapped out! Thanks to all who have dropped by my blog. The last day has arrived!! My Harry Potter theme comes to an end with a few zany fandom posts that I have collected while researching all the other letters. Come back tomorrow for a reflection post! My theme is mostly made up holidays. Today is "Last word in the dictionary day"
Post: Z is for “Zzzzz.” Books that kept me up past bedtime. Congratulations everyone! We finished it! 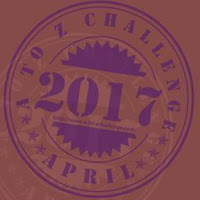 Wrapping up the #AtoZChallenge with Z - Zymology, Zest and Zinfandel! Last day. Congrats to all! Click here for Chapter Z of my A to Z Choose Your Own Adventure (AC)! Comment to vote for the next choice and come back tomorrow for the reveal of the next installment in the novel: Runaway! The final installment of my 26 part story. I managed to do a beginning, middle, and end in just over 22,000 words. If you want to start at the begining, here's a link to A's post. YEAH I made it! Can't wait till next year! Hope everyone enjoyed the ride! Zipper, and we are done! And another A to Z challenge completed! Using A to Z for Sunday inspiration. Niki here, blogging at A Texan's View of Upstate New York! My theme is split this year: half post about occupying my time while my husband was deployed last year, and half posts about different aspects of being an independent consultant for Usborne Books and More! I made it to the end without missing a day! My upcoming Gothic paranormal romance novel was inspired by a song. If you haven't heard of the Japanese band, Buck-Tick, this will make you a fan: listen, watch, enjoy. Here's your LAST CHANCE to sol the A to Z haiku puzzle. Can you figure it out? Stop by WordWacker and find out!